The Mourning Dove - This familiar medium-sized bird, with its slim body and tapered tail, is the most common bird species in North America. It is hunted in 39 out of the 48 conterminous states and on average, hunters take four shots per dove that is bagged. Mourning Dove harvests exceed that of all other migratory game birds- ducks, geese, swans, cranes, rails, woodcock, and snipe combined. 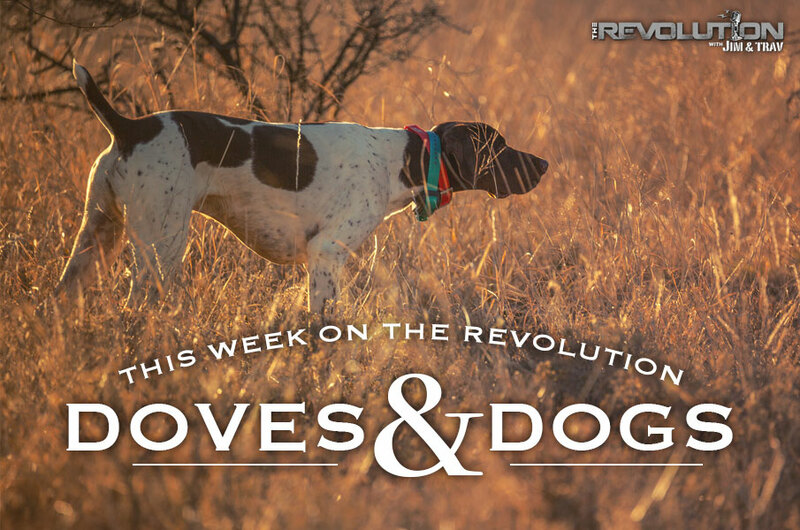 This week on The Revolution with Jim and Trav presented by Outdoor Channel, Sportsman Channel and World Fishing Network, we're all about ‘Doves & Dogs’ and we're going to prep you, our listeners, for high-yield dove hunting results with sound advice on superior shotguns, loads and chokes, practiced and perfected decoying methods, plus the ins and outs of concealment, scouting, commonsense field dressing and sport dog maintenance. Then, to top it off, a few savory and simple dove recipes, because as any dove hunter knows, there is no greater delicacy. Now joining us as we burn through countless shells in fields across the country, will be Chad Belding of The Fowl Life with Chad Belding, Terry Denmon from Mojo TV, the Senior Product Manager for Shotguns at Remington, Daniel Cox, and our very own Mrs. Bunny who will stick around for an exclusive two-part interview that you certainly won't want to miss. The secret to dove hunting success is knowing and understanding how to find the birds. Chad says you need to look for different food sources, water sources, shade and places where the doves will come back and roost for the day and seek shelter from the sun. The weather plays a large roll in dove hunting and those hot early September days are sure to have them looking for water. By identifying frequently traveled paths you’ll be better able to setup in an effective spot. However, stand and pass shooting as the doves come and go from their food to water or roost doesn’t have to be the only tactic you use. Chad encourages hunters to think outside the box and try decoying. He’ll explain how to use decoys and more specifically how to utilize a spinning wing decoy. Finally, he’ll leave us with his favorite way to prepare doves for the dinner table. Tune in to The Revolution for his Teriyaki Citrus Bacon Wrapped Dove Breast. Decoying has been shown to increase a bird hunter’s odds of success. Terry Denmon, President and CEO of MOJO Outdoors, is here this week to talk about the MOJO line of dove decoys and explain how to best use them to attract more doves to your setup. MOJO Outdoors has several choices when it comes to dove decoys, but Terry says the MOJO VOODOO Dove has great success afield. In order to achieve the success you are hoping for, there are a few things he wants hunters to understand about spinning wing decoys. These battery operated decoys automatically spin the wings at a high rate of speed to generate the “flash” or “strobe” that attracts birds from long distances. Terry says that in order to draw birds in from long distances, the wings need to turn at least 400 rpm, but something close to twice that speed is more desirable. He stresses that the speed is completely dependent upon the battery life and as the battery depletes itself the wings will turn slower. The MOJO VOODOO Dove turns in the 750-800 rpm range and the faster they turn the more attractive they seem to be to doves. When used in a visible area, Terry says this is a great long range attractor that can be used anywhere to elevate your setup. “That’s what hunters should do. They ought to make it look like doves are coming to their location to feed, and that will greatly increase their success.” Watch Terry Denmon weekly as the host of MOJO TV seen Saturdays at 3:30 pm ET on Sportsman Channel. All across the country, hunters are ready to hit the field and ring in the fall hunting season by letting some lead fly and bringing home some doves. This week Daniel Cox, Senior Product Manager for Shotguns at Remington, joins Jim and Trav to talk about dove guns. When it comes to dove hunting, it’s a fast paced game that generally affords you a lot of shot opportunities. Keeping that in mind, it stands to reason that most dove hunters would prefer a gun that is lighter in weight so they can shoulder it shot after shot and soft on the recoil so they don’t leave the field with a bruised shoulder. Daniel says this is where the Remington V3 Field Sport really shines. The V3 is a 3-inch chambered autoloading shotgun that blends the VersaPort gas system with a compact lightweight platform. The V3 can cycle 2 ¾ to 3-inch 12 gauge loads and dramatically reduces recoil making it the softest shooting 12 gauge on the market. The VersaPort gas system self regulates gas pressure based on the length of the shell, softens recoil and reduces maintenance for the shooter with its self-cleaning gas piston system. Find out more about the Remington V3 and its surprising price tag, listen now.